A couple of husbands ago, I baked 11 dozen cookies for my first married Christmas. I worried it wasn’t enough because my mother made many, many more cookies each holiday season. She also had many, many more visitors, a fact I ignored. I ended up eating at least half of those11 dozen cookies myself. Now, all these years later, I still have no reason to bake Christmas cookies. I have sworn off sugar, my husband is diabetic and my handful of relatives will visit next month maybe once. I still like to bake cookies, though, so I think up reasons to crank up the oven in December. This year the first batch went to a neighborhood barn dance. The cookies were a triple-ginger with a lemon drizzle. 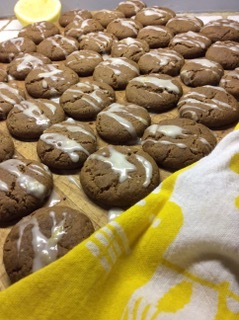 I was trying to duplicate the ginger cookies sold at the late, great West Point Market, but those were soft and mine were as crunchy as ginger snaps. They were delicious. I made a second batch of cookies Monday because I’ve been itching to duplicate the Almond Cloud Cookie I bought at the Brimfield Bread Oven. Finding the recipe wasn’t hard. Baker Genevieve Smith studied pastry-making at the King Arthur Flour Baking School in Vermont, and King Arthur has the recipe on its website. Whatever. They are really sweet but good. So far I have eaten two cookies and am frantically looking for a recipient for the remaining 20. Maybe the Copley cops. 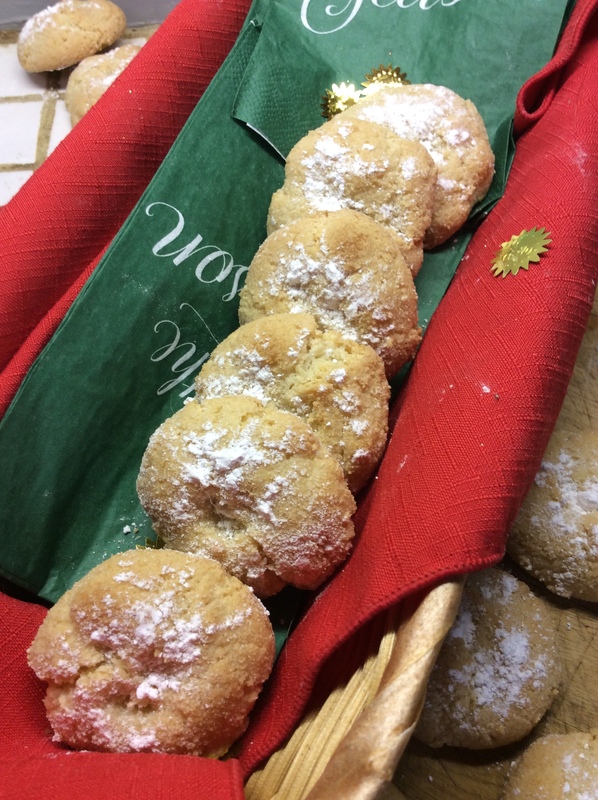 I once took them a loaf of warm, yeasty fruit bread around Christmas, but I think they could make do this year with cookies that taste like almond clouds. Preheat oven to 350 degrees and line two baking sheets with parchment. Whisk first five ingredients and 1/2 teaspoon salt in a medium bowl. Using an electric mixer, beat sugar and shortening in a large bowl until fluffy. Beat in molasses, egg and fresh ginger. On low speed, beat in crystallized ginger and the dry ingredients. Scoop out rounded tablespoons of dough and shape into balls. Arrange 2 inches apart on the baking sheets. Bake at 350 degrees until golden and dry-looking, about 15 minutes. Slip parchment with cookies off the baking sheets and cool, continuing with more batches until dough is used up. Beat the glaze ingredients together until smooth. The icing should be just thin enough to drip off the tines of a fork. Dip a fork in the glaze and wave back and forth over cookies, repeating until each cookie is streaked with glaze. Makes about 3 dozen. Adapted from a recipe in Bon Appetit magazine. egg whites one at a time, mixing to make a smooth paste. Stir in the almond extract. uncovered, for at least 2 hours or as long as overnight. When you’re ready to bake, preheat the oven to 325 degrees. Bake the cookies for 20 to 25 minutes, just until they’re brown around the edges. Remove from the oven and let cool on the pan on a rack. Store cookies in an airtight container at room temperature for up to 10 days; freeze for longer storage. Small Akron-area food businesses will soon have a shared-kitchen space available to rent by the hour in The Well building (a former church) on East Market Street in Akron. Grants from the USDA and several local organizations are paying for the remodeling project, which will include refrigeration and freezer areas, and room for more than one entrepreneur to work at a time, according to Crain’s Cleveland Business. The rental kitchen, which will be known as Akron Food Works, will be a boon to small caterers, food-truck owners and farmers’ market purveyors who do not have a professional, inspected facility of their own. The kitchen should be up and running by late spring. I ate the last of the Thanksgiving stuffing on Sunday and I’m still licking my chops. This year I made the usual cornbread and sausage stuffing — dressing to you Southerners — and piled it into a casserole for baking. Then I had an inspiration: Wouldn’t this taste even better as a custard? I envisioned a sort of a cross between stuffing and bread pudding. I moistened the stuffing lightly with turkey broth, then beat a couple of eggs into 1 1/2 cups of milk, which I poured evenly over the stuffing. Into the oven it went (350 degrees for about 30 to 40 minutes). Yeow. The stuffing was set and slightly puffed. The texture was mostly stuffing-like, but laced with enough egg custard to make it moist and faintly pudding-ish. I will dream of this stuffing until next Thanksgiving. Hamburger sliders on egg buns; meatloaf, oven-roasted cubed potatoes with olive oil and garlic; pineapple mousse pie, pumpkin pie, cornbread; brined, grill-smoked turkey, mashed potatoes and gravy, whipped sweet potatoes with bourbon, cornbread and sausage custard stuffing, sugar-free whole cranberry sauce with dried apricots and toasted pecans. Greek lemon-orzo soup and a mushroom burger at Alexandri’s in Wadsworth; pulled pork, coleslaw and a corn muffin at Old Carolina Barbecue in Fairlawn. I also read the New York Times article about not brining. What a crock. I did a large brined turkey breast and several thighs last year for my niece and her adult family. Everyone could not get enough of the turkey. I will continue to brine. Some things simply work. Some traditions are really just bad habits. Others are truly the result of trial and error and should be used and treasured. Yes! Tony and I loved the turkey I brined last week and roasted over charcoal on my Weber. I brine pork chops, too, with great results. I grew up in Akron and occasionally we went to the Akron City Club downtown for special meals. They served a very rich shrimp dish called Shrimp ACC. It was served over toast points or very thin shoestring potatoes. Do you happen to have this recipe to share? I remember dining at the City Club but never had the shrimp, nor do I have the recipe. I tried to contact the former chef, Ed Valente, but discovered that he died in 2015 in Lexington, Ky., where he had relocated after leaving Akron. Ed was a dear man. Maybe someone who worked at the club back then is reading this and has the recipe. If so, would you please share? The fall-off-the-bone juiciness of supermarket rotisserie chicken, even more than the convenience/cost ratio, has meant that I haven’t roasted a whole chicken for years. Can a home oven mimic the rotisserie effect without continuous rotation? Would one just extend roasting time or seek a higher end temperature to achieve fall-off-the-bone juiciness? Chefs love to hate on supermarket rotisserie chicken. What you call “fall-off-the bone” tenderness they call “mushy.” I once tried to duplicate supermarket rotisserie chicken at home, but I concentrated on the seasoning. Brining a chicken will produce juiciness, and seasoning the skin will produce flavor, but neither will provide the texture you want. I think that texture is the result of not just turning the chicken over a heat source, but doing so in a confined, tightly closed space. In other words, kind of steaming it. Do not simply roast your chicken longer and/or bring it to a higher internal temperature. That will produce dry, stringy chicken — the opposite of your goal. I suggest you brine, season the skin, and roast in the classic fashion. Then compare. Maybe — and I write this with zero snark — maybe you have forgotten what a great roast chicken tastes like.